It goes without saying, but I’m saying it anyway because the blog post demands it, that there is something utterly magical about Mary Poppins. The way she appears from nowhere, knows exactly what needs to be done and wastes no time doing in the most imaganative ways possible is nothing short of fabulously wonderful, and the first full trailer for the upcmoming sequel to 1964’s Mary Poppins reveals all kinds of magic, animated and otherwise, at play when mary returns once again. There is, of course, music, worlds within worlds and some tough love, reflecting the books of P. L. Travers which were always a lot darker than Disney ever allowed for, and it’s good to see, even though I am ardent fan of Julie Andrews’ performance in the original film, how the talented Emily Blunt gives Mary a sharper edge. The tale though is ultimately redemptive and there is no doubt that by the end of the film everyone will be better for Mary Poppins being there, but oh what fun we shall have arriving at that magical place! 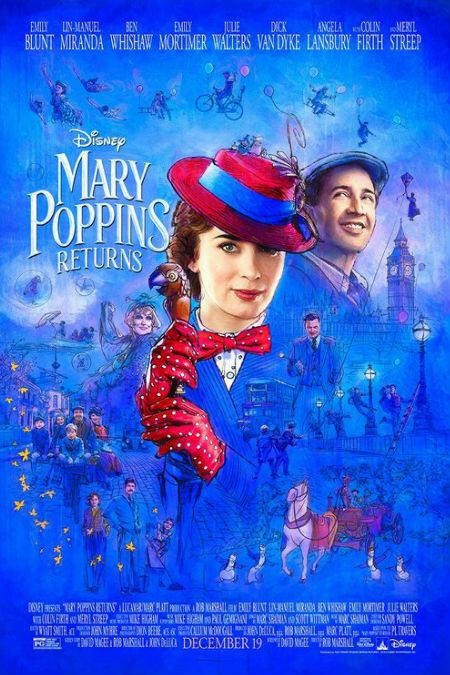 Mary Poppins Returns premieres USA on 19 December, UK on 21 December and Australia on 1 January 2019.